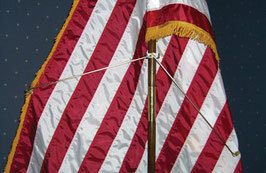 Used with indoor flagpole sets, the Flag Spreader assures that your flag's colors and field are on full display. Sure-Grip Clips hold flag securely in place. The Flag Spreader comes with a Vinyl-coated pole bracket attachment. *For 1" to 1.25" outside diameter poles.